As has been practiced for over a century within the Archeparchy – and centuries before in Ukraine - the Ukrainian Catholic faithful, on and around the feast of Pentecost, gather at their cemeteries to remember in prayer their loved ones and ancestors. This occurs all across the province of Manitoba in cities and small villages and at single all, but forgotten pioneer cemeteries in the middle of fields and forests. In the city of Winnipeg, the tradition of late is that on the eve of the Feast of the Descent of the Holy Spirit on Saturday afternoon, the Archbishop of Winnipeg, Metropolitan Lawrence Huculak gathers with his Priests and Deacons, the religious Sisters and a crowd of lay faithful to pray at Holy Family Cemetery north of the city. This cemetery is overseen by the Basilian Fathers at St. Nicholas Parish in Winnipeg. Fr. Zachary Shwaluk, OSBM maintains the excellent burial grounds for many of the Ukrainian Catholic community’s Bishops, Priests, Sisters and Faithful. This Year, the services began at 2:00 PM. After the initial services with everyone participating, it is the custom that families would ask individual priests or deacons to hold a small service on the graves of their deceased family members. 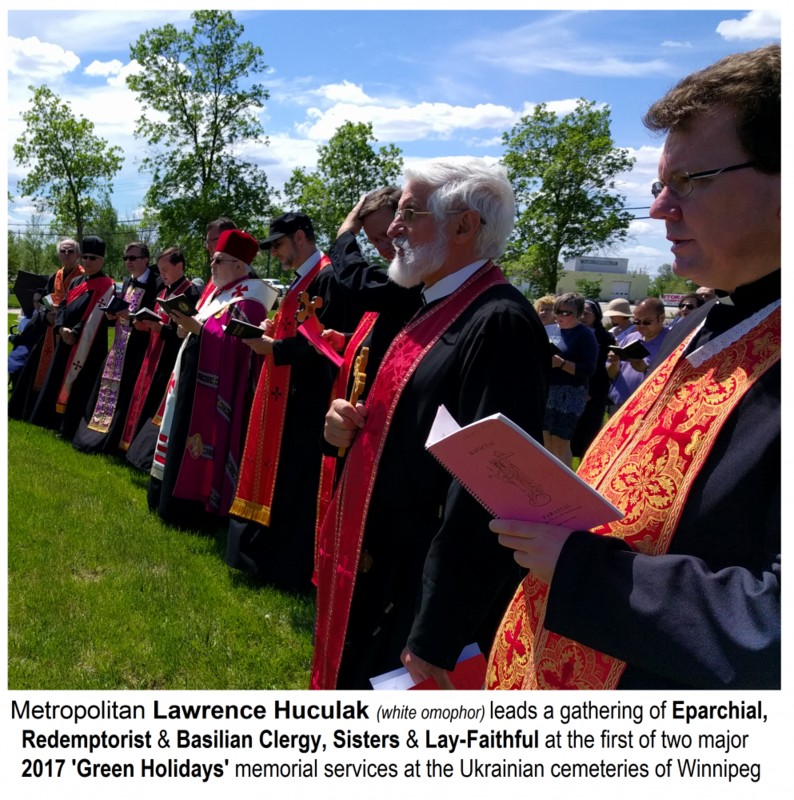 The following day, on Pentecost Sunday itself, the Ukrainian community gathers at All Saints Cemetery also on Main Street, but slightly further north. Here the same initial services are held on the Grave of the late first Metropolitan of Winnipeg – His Grace Archbishop Maxim Hermaniuk, CSsR. Then a panakhyda is held for the many priests and deacons buried there. One element that differentiate the All Saints event is the patriotic spirit where Ukrainian heroes are remembered at the large monument built to honour the faithful sons and daughters of the Ukrainian People that gave their lives for the cause of Ukrainian Freedom. This includes historic figures as well as the 7 million+ victims of the Holodomor genocide as well as many others – including the more recent “Heavenly Hundred” that were gunned down on the Maidan in Kyiv and the over 10,000 that have died and continue to die in the war with Russia in Eastern Ukraine. At both cemeteries, a special commemoration was made of His Beatitude Lubomyr Cardinal Husar, the former Head of the Ukrainian Catholic Church. The funeral services for Husar were taking place in Ukraine at the very same time in the cities of Lviv and Kyiv.